THIS PAGE IS RESERVED STRICTLY FOR MAJOR AND MINOR LEAGUE BASEBALL ORGANIZATIONS, CLUBS, AFFILIATES, STAFF AND EMPLOYEES. 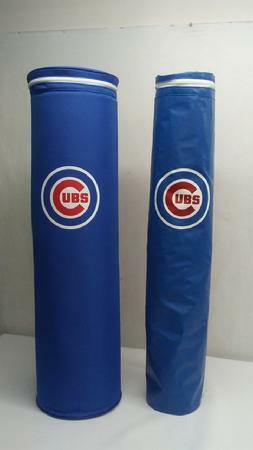 MLB LICENSING DOES NOT PERMIT THE SALE OF THESE ITEMS WITH THEIR LOGO TO THE GENERAL PUBLIC. THIS IS OUR LARGE BAT BAG. FEATURES INCLUDE, REINFORCED VINYL ON TOP AND BOTTOM, 2 HANDLES FOR EASIER CARRYING, ID WINDOW ON TOP. MEASURES 12x12x36. HOLD 20-30 BATS. 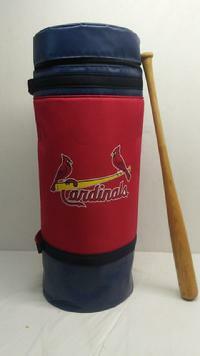 WE HAVE A SLIGHTLY SMALLER VERSION OF THIS BAG, SAME FEATURES, HOLDS 12 BATS. MEASURES 9x10x36. 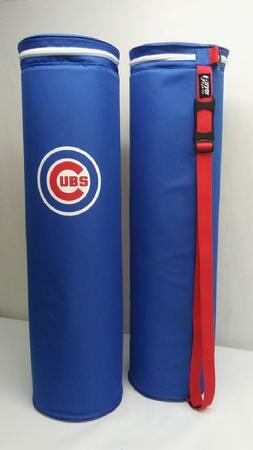 THIS IS OUR LARGE PADDED BAT BAG. VERY STURDY. VINYL REINFORCEMENT ON TOP AND BOTTOM FOR EXTRA PROTECTION. 2 HANDLES FOR EASIER HANDLING. ID WINDOW ON TOP. HOLDS 20-30 BATS. MEASURES 14x14x36. WE HAVE A SMALLER VERSION THAT MEASURES 12x12x36. HOLDS 12 BATS. THIS BAT BAG CAN BE MADE FROM 600 DENIER OR VINYL MATERIAL, WITH OR WITHOUT PADDING, THE CHOICE IS YOURS! HOLDS 6-8 BATS. MEASURES 6x36. WITHOUT PADDING (ITEM #680Z) $48.00. BELOW IS OUR COMBINATION BAT BAG. LOTS OF ROOM INSIDE TO CARRY ALL OF YOUR EQUIPMENT. A 3" POCKET UNDERNEATH WILL HOLD 4 BATS. VELCRO HANDLE. MEASURES 12x14x34. OUR BACKPACK BAT BAG HAS A LARGE COMPARTMENT INSIDE, A SMALL ZIPPERED POCKET ON THE FRONT TO HOLD YOUR CELL PHONE, KEYS, ETC AND OPTIONAL 1 OR 2 BAT SLEEVES TO EASILY CARRY YOUR BATS. PADDED SHOULDER STRAPS FOR COMFORT. PRICES ARE INCLUDED IN DESCRIPTION OF EACH ITEM. IF YOU WOULD LIKE TO PERSONALIZE YOUR ITEM(S), MONOGRAMMING IS AVAILABLE. $9.00 FOR INITIALS OR A SINGLE NAME - $15.00 FOR A FULL NAME.